Millvina Dean, the last surviving Titanic passenger, has passed away at age 97. Dean was only nine weeks old and headed to the United States with her family when the legendary ship went down. Of course, she remembered nothing of the voyage, but had the Titanic not sank, she would've been an American (her mother returned the family to England after the tragedy). Let's look back at the maiden voyage of a vessel that took three thousand laborers two years to complete, and which was, at the time, the largest man-made moving object in the world. She weighed 66,000 tons and was approximately four city blocks long. 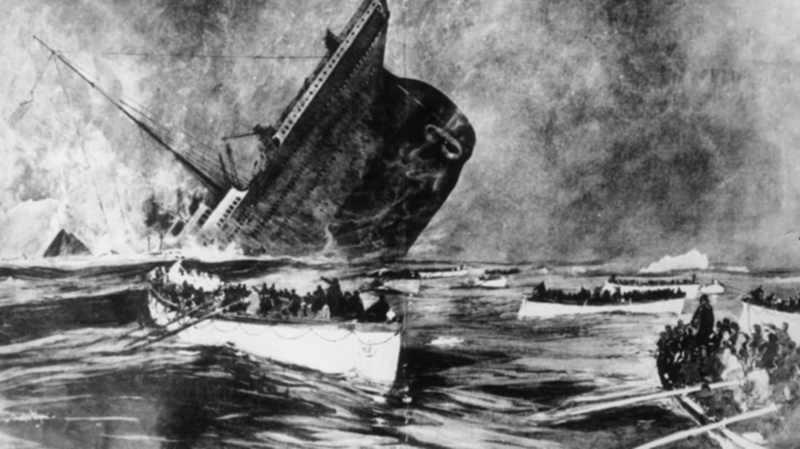 Titanic had 20 lifeboats on board, which was four more than were required by law at that time. Since the ship was considered to be unsinkable, White Star executives didn't worry that there was lifeboat space available for only half of the ship's passengers. The first class passengers aboard Titanic paid the equivalent of $124,000 each in today's dollars for passage from Southampton, England, to New York. Their dinner menu on April 14 (the evening before the accident) was a 10-course affair that included an oyster appetizer, cream of barley soup, and poached salmon with Mousseline sauce and cucumbers. They also feasted on filet mignon, lamb with mint sauce, roast duckling and sirloin of beef. Third class passengers enjoyed a lesser dinner, starting out with rice soup, followed by a main course of roast beef with brown gravy and boiled potatoes. On most other liners at that time, third class travelers had to bring their own food, so roast beef was something of a gourmet treat for them. The smoking lounge was for men only, so many of the ladies gathered in the ship's Georgian-style reading room. George Widener, owner of a streetcar company in Philadelphia, was hosting a party on B Deck along with his wife, Eleanor. Some of the ship's most prominent passengers were in attendance, including Captain Edward John Smith. The captain excused himself at 9:00, and after checking in at the bridge, retired at about 9:30. About 100 of the Titanic's second class passengers gathered in the dining salon at the end of the meal service to sing hymns. The folks down in steerage held a raucous party that lasted until "lights out" at 10:00 that evening. Ruth Becker was a second class passenger traveling with her mother, sister and brother. The Titanic was a "floating palace" in the 12-year-old's eyes, and she enjoyed exploring the ship while pushing her one-year-old brother around in his stroller. Becker's family was headed home to America from India, where her father worked as a missionary. Eighteen-year-old Anna Turja was traveling to the United States from Finland. She was bound for Ashtabula, Ohio, where her brother-in-law had offered her a job in his store. He'd purchased a $50 third class ticket for Anna's passage. Contrary to what we've seen in most films, Turja recalled that the accommodations in steerage were clean and comfortable, with lots of camaraderie among the passengers. At 11:40 PM, the Titanic collided with a massive iceberg on its starboard side, which scraped along the first 300 feet of the hull, below the waterline. The collision damaged six of the ship's 16 watertight compartments, and water began pouring in. Captain Smith rushed to the bridge and asked, "What have we struck? " Shortly after midnight, Thomas Andrews, the ship's designer, reported to the captain that the Titanic was doomed, and that it would sink in less than two hours. When a group of men in evening dress were advised to put on their life preservers, George Widener replied, "What sense is there in that? This ship isn't going to sink. " The passengers sleeping in the forward cabins of steerage were jolted awake. Anna Turja felt her bunk shudder, and then an attendant knocked on her cabin door and instructed her to put on some warm clothing and a life jacket. As water began leaking into several cabins, most of the third class passengers made their way up to the open deck. The orchestra could still be heard playing in the smoking lounge. Ruth Becker's mother awoke when the ship's engines stopped, and a steward told the family to report on deck. The family ascended five flights of stairs, joining scores of weeping women in all states of dress and undress. Ruth's mother sent her back to their cabin to retrieve some blankets. George Widener realized the severity of the situation and began assisting women and children into lifeboats. "What is the outlook? " he asked Captain Smith, who replied that the situation was extremely serious and that they should continue to provide all the assistance they could. George's wife, Eleanor, was one of the last women to board a lifeboat. She protested so strongly that sailors had to lift her up and physically deposit her into the craft. Her husband and son went down with the Titanic. Anna Turja (pictured), like many of the immigrants aboard, didn't quite understand the commotion around her because she didn't speak very much English. Anna was under the impression that the Titanic was unsinkable, so she wasn't frightened. She enjoyed the music still being played, and would've remained on deck listening to the orchestra if a sailor hadn't forced her into one of the canvas lifeboats. Turja was the second-to-last passenger to leave the ship. When Ruth Becker returned to the deck with blankets, she found that her mother and siblings had been loaded onto a lifeboat that was declared "all full" and was being lowered. Her mother screamed in anguish, and an officer picked up Ruth and literally threw her into lifeboat number 13. She was reunited with her family the next day on board the Carpathia.